Unfortunately, I was stuck in the school computer lab until 6pm the other night fulfilling some idiotic district mandate (can I get in trouble for broadcasting that over the internet?). When I needed to let some steam escape from my overtaxed brain, I struck up conversation with one of my colleagues who is in the wedding planning process. We specifically talked about Etsy and what a wonderful, delightful, surprisingly splendid place it can be for inexpensive, hand-crafted, beautiful engagement/wedding rings. Like this ring for $68. I don't know much about the nuances of jewelry (I'm guessing sterling silver isn't as good as gold? ), but there are a lot of different options on Etsy. We got our rings from an antique shop, but we looked at etsy too....They have beautiful stuff. garnetgirl has beautiful stackable rings! These are all recycled metals and conflict-free stones in organic settings. Her prices are so reasonable- some non-diamond engagement rings are less than $100! 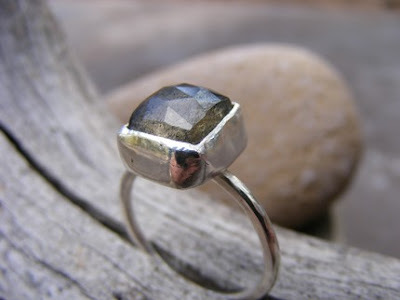 Not sure if anyone has had experience with Brilliant Earth but my engagement ring is made by them, 100% receycled metal and an ethically sourced diamond from canada. I even got a certificate telling me what health and safety standards are enforced for the workers! Great customer service too. And I also love anything by onegarnetgirl on etsy. I love all of her work and ethics. We plan on having something custom made for my wedding ring. Does anyone know if any of these artists with design just a setting? My fiance's mother gave him her diamond (marquis) from her engagement ring to his dad, and we're looking to put it in a setting, but I don't want to go to a standard jewelry store. So many of the etsy, turtle love, and other rings are so beautiful and fit right in with the ethical and environmental message I would love to encompass with my ring. Any help would be fabulous! @Anon: I would imagine most of those designers would be more than willing to do custom work and to fit the stone you already have. I find symbolism in the two sides really being one and have a soft spot for learning about Mobius strips from Mr. Wizard. Oh heavens yes! Ruff House Art. Jill is making my invitations (in two languages), and he been overly accommodating and kind. I also bought my wedding earrings on Etsy from Silver Nutmeg Studios. You can't bet a $9 accessory, and they're stunningly pretty leaves. We got my ring from the seller sue lane and he got his ring from the seller jim daling. They were in the several hundred dollar range, but we just loved the styles and hadn't seen anything like them anywhere else. Both have been great to work with. We got my wedding set from Kate Szabone's etsy shop for less than $300 and the rings are absolutely beautiful. Rose gold, grey diamond engagement ring, hammered rose gold stackable ring on each side. We're etsy browsing for his band now! The service and quality are fantastic, btw. One of the rings didn't fit + we had to send it back, and he was super polite and speedily fixed the ring for us. We special-ordered it in white gold without the oxidation and it is absolutely perfect. Rachael Sudlow was wonderful to work with and her prices were quite reasonable. This is such an amazingly helpful post! My fiance and I are definitely going to be trying to plan on a budget, and all the etsy links are a great place for us to start looking for rings. Thanks so much! Heart of Water Jewels does some fabulous work, as does Julia Kay Taylor.